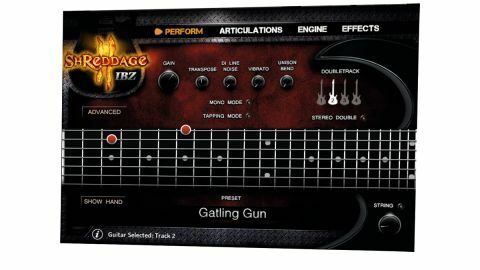 Shreddage 2 IBZ is capable of producing hard-hitting guitar riffs and lines practically indistinguishable from the real thing. No chord engine. Not all that versatile. A souped-up, spikier and more aggressive-sounding alternative to the original Shreddage 2, Shreddage 2 IBZ is a lead guitar instrument for Kontakt 5 and Kontakt Player, built on a multisampled Ibanez RG7421. Like its stablemate, it's a seven-stringed instrument tuned to drop G, and owners of Shreddage 2 can get it for $119. Requiring 5.5GB of disk space for its 13,000+ samples, IBZ is spectacularly comprehensive in terms of articulations and technical variations. Every fret on every string has been sampled for every articulation - Sustain, Mute, Staccato, Tremolo, Pinch, Harmonic, Hammer/Pull, Portamento and FX - with separate up and down strokes, 'real' hard and vibrato sustain variations, and up to four round robins per pitch/ articulation/stroke. Being primarily aimed at rock and metal, however, each articulation only has a single velocity layer. The interface divides a wealth of sound and performance customisation features over four main pages - Perform, Articulations, Engine and Effects - plus an Advanced options dialog for tweaking portamento, palm mute layers, keyswitches, etc. Instant stereo double tracking is a button press away, and using the Doubletrack 1-4 buttons, up to four tracks can be layered in a single instance of Kontakt, each playing its own round-robin sequence for an authentic overdubbed feel. Then there's assignment of articulations to keyswitches, velocity layers and MIDI CC ranges; separate power chord assignment; LFO-based vibrato; optional extra pick noise and much more. The Effects rack houses distortion, amp/cab simulation, EQ (pre-amp, post-amp and post- cab), Compressor, Chorus and Delay modules, all of which sound great. With the raw samples being clean and unprocessed, it is possible to get 'non-metal' tones out of IBZ, although the lack of velocity layers limits its serious usage in most other genres. The absence of a chord engine is slightly disappointing, and that single velocity layer is a definite limitation outside metal, but if your programming skills and understanding of guitar playing technique are up to scratch, Shreddage 2 IBZ is a very impressive instrument.